Thread: Images works on an applet, but doesn't work when an applet is in a JFrame. i'm new here and i am new in java and using ECLIPSE. So, very shortly. The problem is explained in the title. // i put there spaces cuz this site auto edits image patch. Everything looks just fine in an applet, as u can see in a picture above. I tried to use 'getCodeBase()' in getImage method instead of 'url', but then an applet w/ JFrame don't even start and errors appear. My images are placed in src/images folder. Should I use other image drawing methods? Last edited by scorpas; May 18th, 2012 at 02:17 PM. Re: Images works on an applet, but doesn't work when an applet is in a JFrame. You've got empty 'catch' clauses in your code. Just never, ever do that. Put a 'e.printStackTrace()' in there, or don't catch the Exceptions (where that's allowed by the signature of the method you're overriding) and you'll be able to answer your own question. Please post the full text of any error messages. Applets require the services of an AppletContext normally provided by a browser. Unless you create an appletcontext and set it for the applet, the applet can not use any of the services provide by the appletcontext. See the API doc to see what methods are involved. My JFrame works like that: I press run (Window) on Eclipse, JFrame appears, then i click Start button, and applet shows up in the same window. at Zaidimas.Window.GameStart(Window.java:70) // app.init(); - in init method i use getDocumentBase() method. at Zaidimas.Window$7.actionPerformed(Window.java:205) // GameStart(); - in this i use init() method. From that I can say, that there is something wrong w/ getDocumentBase(); in my init(); method. So the problem is in init(); method and it looks like Eclipse (or i should say JFrame) don't understand getCodeBase() or getDocumentBase() methods. I need to change somehow those methods, to get images on an applet in JFrame. Last edited by scorpas; May 18th, 2012 at 06:00 AM. to get images on an applet in JFrame. Did you read post#3 about applets and browsers and appletContext? Unless you provide the services of the appletcontext, its methods will not work. That just a simple java game, that will be runnable from .jar file. Anyway, i don't get it how i cant provide it. where i should use it? in JFrame class or in an applet class? Last edited by scorpas; May 18th, 2012 at 06:47 AM. If you are not going to use the applet code in a browser that provides the applet stub and context, then you will need to rewrite the code so it does not extend the applet class or use any of the applet methods. It is possible to write code for the applet context and stub and use the setStub() method to provide those services to your applet. Where can i find any example how those methods are useing? Create a class that implements AppletStub. Create an instance of your applet class and call its setStub() method passing it an instance of your class that implements AppletStub.. Put println statements in all its methods and see which are called by your applet. add code to those methods to do what they need to do. Last edited by Norm; May 18th, 2012 at 07:45 AM. 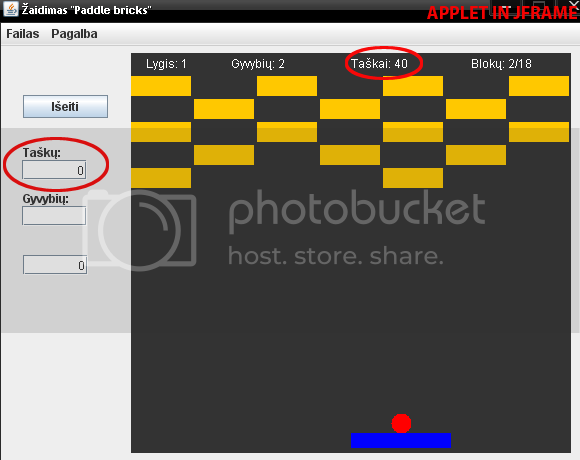 btw, maybe there is another way to create GUI for an applet without losing images loading? Last edited by scorpas; May 18th, 2012 at 09:28 AM. Call its setStub() method passing it an instance of your class that implements AppletStub. Put println statements in all the MyStub class's methods and see which are called by your applet when it is executed. Add code to those methods to do what they need to do. Last edited by Norm; May 18th, 2012 at 09:22 AM. -syntax error on token "setStub", = expected after this token. Can you post the source code that has the error? And the full text of the compiler's error messages. Last line, under setStub red 'waved' line, and when i check on the left what kind of error it is, there are written what i already wrote above about this error. The code for setting the AppletStub goes with the applet you are using in post#1. Not in the AppletStub class. After you create an instance of your applet class, call its setStub() method. is there any other ways/methods to draw images? Are you trying to draw images or display an existing image? if you want your applet to work without a browser, then you would continue doing what I have suggested. It will take more code that way then writing new code for your app because you have to do everything that the browser would have done . If you want to display an image look at the ImageIO class for ways to read an image file. the problem is, that i don't understand ur suggestion. i tried to create in the Main class getCodeBase() and getDocumentBase() methods. Those methods are for applets. If you are not going to execute the code as an applet in a browser, you need to get rid of those methods and use methods suitable for applications. Don't extend the applet class. Which are you trying to write? An applet for a browser or an app for a PC? If you want to read an image from a disk file use the ImageIO class's methods. an app for a PC (my task is to create something who works on Linux). Runnable from .jar file after double clicks on it. as I said, my images are in 'this_project/src/images' folder. Get rid of the applet class's methods and use the ImageIO class's read methods to read the image files. Will the images be in the jar file or outside of it? If inside you should use the read(URL) method and get the URL by using the Class class's getResource() method. Yeah. Finally, u are genius, man!!! any ideas how to fix lag? No idea without seeing the code. sleep change the speed of an applet, but lag still remains. i guess it is something with repaint() method. A common mistake is to load the images every time they are displayed instead of doing it one time. By slahsdash in forum What's Wrong With My Code? How do you put files and images where your applet can get them? [SOLVED] Java Noob, Jframe in Applet.